The excavation in Novy Svet continues. Piles of pottery are heaped along the boundaries of the trenches as we dig ever deeper into the seafloor. These will be counted for statistical analysis at the end of the season. Gravel and sand constantly fall back into the trenches. This has to be removed daily using buckets and dumping the spoil in designated areas. We dig by fanning the surface with our hands--an excellent way to find even the smallest finds. Much like a trowel in terrestrial archaeology, each stroke of the hand removes a very small layer of seafloor, exposing what lies below. We often find badly corroded pieces of metal, perhaps remnants of the ship's fittings. The study of these pieces will hopefully reveal something about how the ship was rigged or constructed. Animal remains are quite common as well and we have found many bones of cattle, horses, and pigs. Many of these show signs of butchering as well leading us to think they were in part the food supply of the sailors. Finds can be quite large also, like this massive pithos (storage jar) sherd almost a meter wide and three centimeters thick. Notice the corroded metal lump attached to its surface. 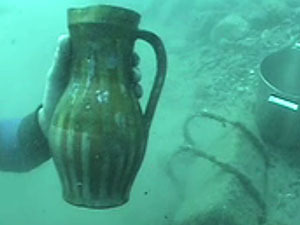 The condition of some finds never ceases to amaze even the seasoned diver here, like this jug that was decorated in white slip and then glazed. Sometimes we find an artifact that is quite large and buried deeply in the sediment. For these special situations we employ our diver propulsion vehicle, also known as the scooter. This device can tow a diver much like a hand held torpedo, but when its direction is reversed it becomes a powerful excavation tool. Like a mechanical fan it blows sand and gravel away at a rate much faster than a diver could accomplish manually. Working with a partner to look for other important artifacts that might be uncovered in the whirlwind, a large amphora is uncovered. At first it is thought that this could be a complete and intact vessel, but it is soon revealed to be just the upper half. Graffiti can be clearly seen scratched on the surface. What these symbols exactly mean is just one goal of the project's research during the academic year at the University of Kiev. After our ascent we return to the beach where we are met by a school of small silver fish. Captivated by their movement, we stay awhile longer to enjoy the show before returning to dry land. The excitement is hardly over once the finds have been brought to the surface. The daily ritual of examining the artifacts at the artifact table is not to be missed by anyone at camp. There ideas are exchanged, theories discussed, and many vessels find their long lost missing pieces and become whole once again. Always in the middle of the action is Assistant Director Yana Morozova. 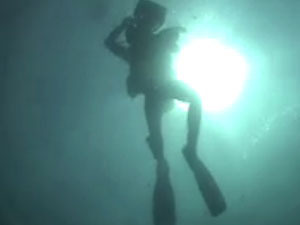 While a diver herself, she seldom dives as her duties require her to stay at camp most of the time. She must be content for the finds to come to her here at the table where she can share her knowledge and the experience of discovery with the rest of us. A large piece of worked wood looks like a promising piece of our wreck. But until we can have the piece the piece analyzed at the lab we cannot be sure if it is in fact ancient. Even the very small things can be exciting, like this fragment of a wooden comb soaking in a glass of water to prevent its rapid deterioration or this small decorated sherd of rare pottery that Yana discusses with Claire Collins.